For decades the Porsche 914 and 914-6 have lived in the shadows. Now, finally, demand is on the rise. The cars turn heads and offer a unique motoring experience. Have you looked at Porsche 914 prices lately? 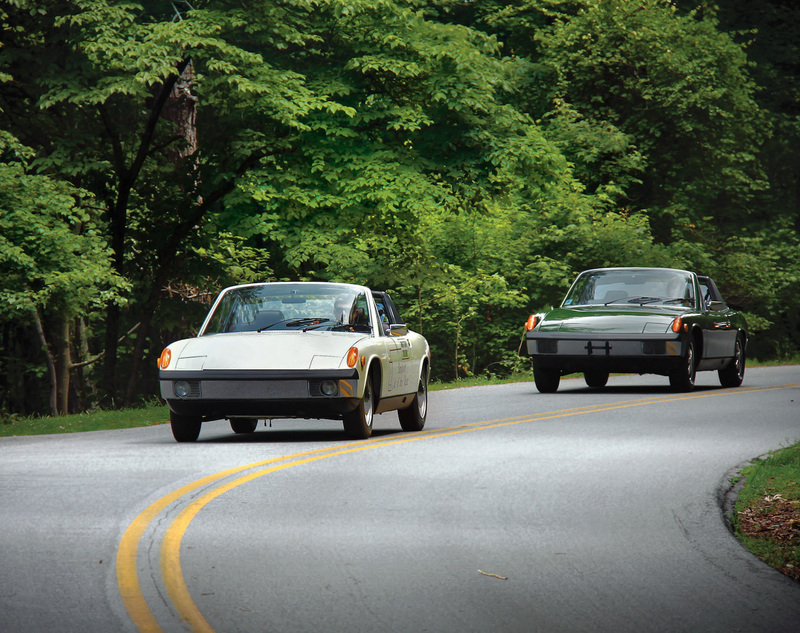 They’ve been ticking upward, and the 911-powered 914-6 is leading the charge. The model, much maligned and largely forgotten for decades, is now coming into its own. But is the six-cylinder car really worth the price premium over the standard-issue, four-cylinder 914? And is either car a good alternative to a tried-and-true MG, Triumph or Alfa Romeo? We found examples of both mid-engine Porsches in Marietta, Georgia, at Automobile Atlanta, an all-in-one dealership, shop and parts supplier that’s been a haven for these cars for 40 years. 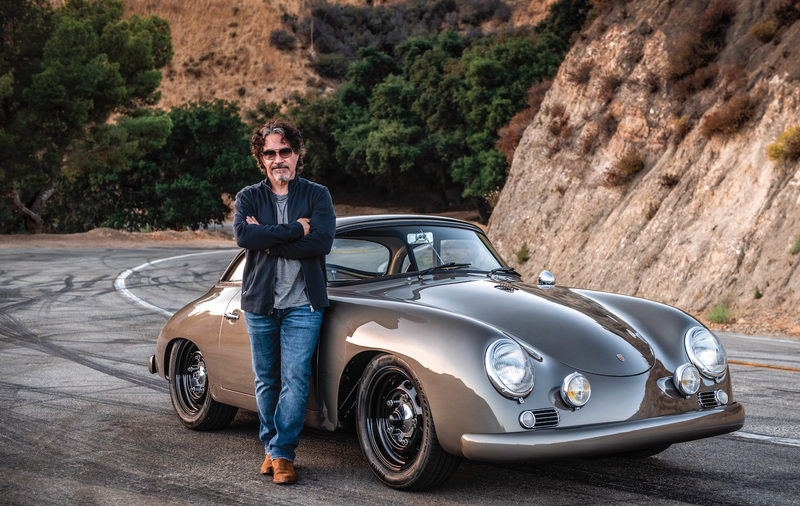 Company owner George Hussey has made it his life’s mission to know, love and support these Porsche orphans. He presented us with two cars for our comparison test: a perfectly restored 914 and a very low-mileage 914-6. Even with X-ray vision, the 914 and 914-6 look surprisingly similar: wide cockpit, lift-off top and two trunks. The 914 model line sprang from a convoluted marriage of manufacturers that only got more dysfunctional as time passed. It was basically a shared project between Porsche and Volkswagen. In fact, in Europe these cars were sold as VW-Porsches. The plan was reasonable enough. Porsche would flex its performance chops to design a sports car body, and Volkswagen would tap its greater resources to produce it. Each company would sell its own badged version of this new creation, giving Volkswagen a halo car and Porsche a replacement for its lower-priced 912. VW planned to power the car with its flat-four Type 4 engine. Porsche, meanwhile, would drop in its iconic flat-six. And then Volkswagen’s chairman, Heinz Nordhoff, passed away, revealing a slight issue: This whole deal was sealed with a handshake, not any formal contract. Mayhem ensued. With Nordhoff gone, Volkswagen didn’t want to sell a sports car after all–at least, not in the United States. Without VW sharing the costs, Porsche was left holding the bag on a limited-production machine based on a unique chassis. To make matters worse, VW charged Porsche more than expected for the bodies. The situation looked grim. Would Porsche buyers want a sports car associated with the Volkswagen name? And with the 911T costing only slightly more, why wouldn’t they just buy the “real thing”? The 914 arrived to mixed reviews. Testers of the day praised the four-wheel-disc brakes and the long legs provided by the five-speed gearbox. Handling and driver comfort, they agreed, were spot-on for the class, too. At the same time, they pooh-poohed the rather anemic, sub-100-horsepower VW engine that didn’t want to rev past 5000 rpm. And then there was the car’s appearance. Love or hate the styling, it was eminently practical. Karmann had designed a simple, Targa-topped body that offered the safety of a roll bar and the convenience of two trunks–one at each end of the car. 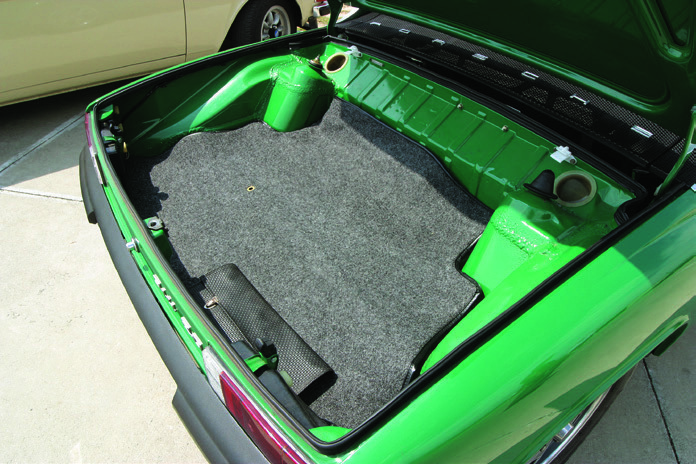 The 914 rivaled its contemporaries in storage space, and the rear cargo hold perfectly stowed the lightweight, fiberglass hardtop. Meanwhile, the layout placed the engine’s heat and noise behind the car’s occupants. It was engineering genius. But this otherwise fantastic sports car had a true Achilles’ heel: the shifting. 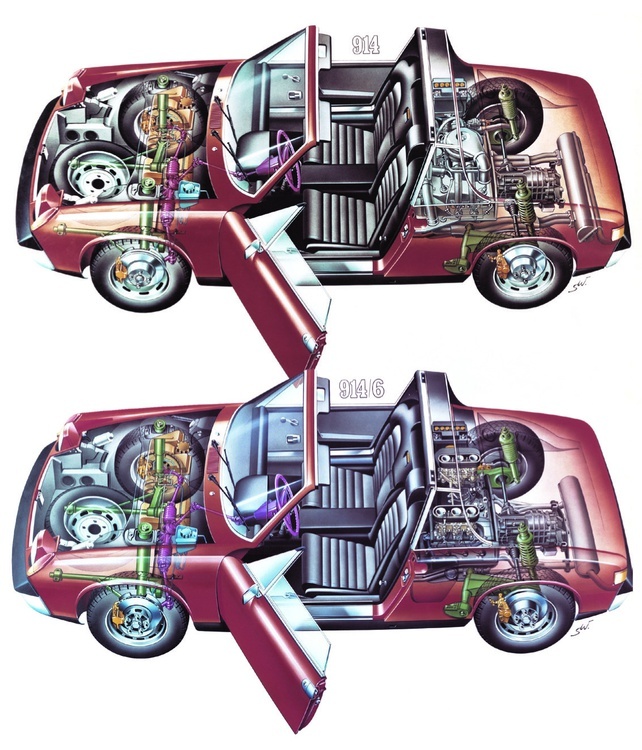 Porsche engineers took the same dogleg five-speed transmission from the 911 and flipped it around for the 914. Then they designed some very long, not always precise gear linkage. Try to autocross one of these cars or row the gears through some twisties, and you’ll realize why the 914 spent so many years steeped in controversy. Road & Track compared the 914 against the MGB, Fiat Spider and Triumph TR6 in its June 1970 issue, and only one of the test drivers found the Porsche’s gearbox acceptable. The article summarized the car as “futuristic but unresolved,” noting that it finished near either first or last in every category judged. The 914 ran through the 1976 model year, with some 118,000 units delivered worldwide. It outsold the 911, making it far more popular than it was prestigious. 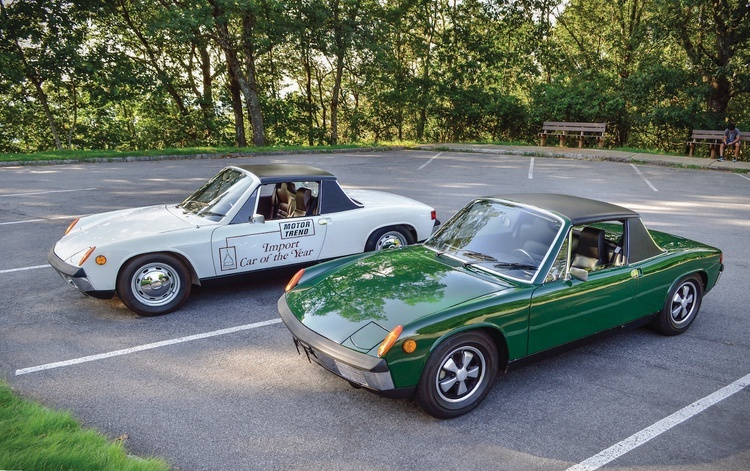 Our two test cars--the white 914 and the green 914-6--were both very close to stock specs. 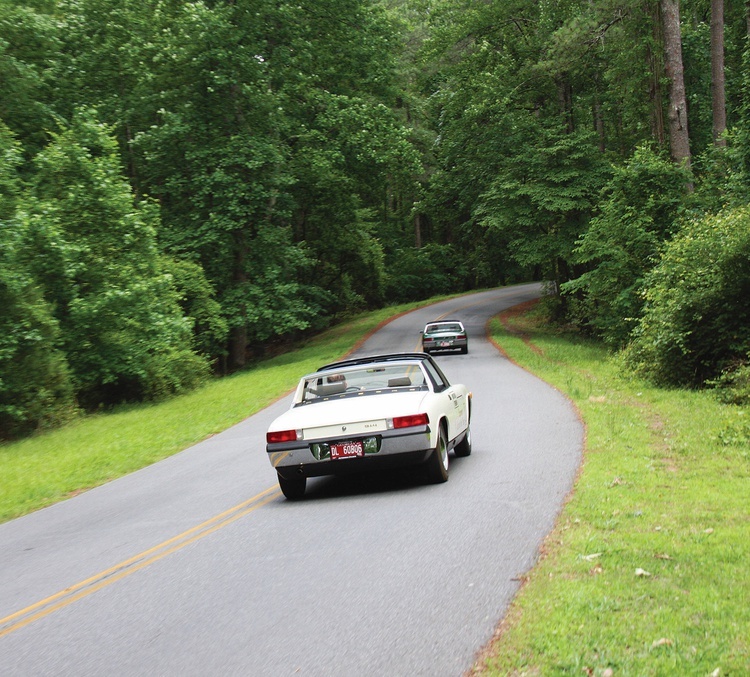 The 1971 Porsche 914 we tested is totally stock, from its fuel-injected, 1.7-liter engine to its suspension. However, it does have an interesting history: Motor Trend magazine lettered up this car and gave it away as part of a promotion. The winner, who lived in Atlanta, put some 300,000 miles on the car before it suffered a mechanical failure. That’s when it was left to sit in a basement garage. The owner was an Automobile Atlanta customer, and George was able to purchase the car a decade or so ago after the owner passed. What he uncovered was a very sound, very original 914. It hadn’t been maintained sympathetically, but once the underside was cleaned of red Georgia clay, George found that the car was rust-free. Aside from a few parking lot dents and a need for some mechanical work, it was in great shape. George decided to completely restore the car to its original state, complete with Motor Trend graphics. It’s now part of his 914 collection, which includes the some of the world’s rarest variants. Our 914-6 test car is a survivor. With only 5100 original miles on the odometer, this Zambezi Green example with tan interior basically replicates what a brand-new 914-6 felt, smelled and drove like back in 1970. A customer of Automobile Atlanta, Clint Hubbard, recently found it in New Jersey. George has been through the car, mainly just to clean up some details. It was shown at the Pinehurst Concours in the preservation class. The 914 spent years being overshadowed by its 911 siblings, both in terms of respect and market value. The best examples used to top out near $20,000, while nice drivers went for about half that amount. Today, though, the 914 is seen as a more modern, easier-to-drive alternative to the 911, and the prices reflect that fact. Hagerty’s Valuation Tool shows that 914 prices have been on an upward trajectory since late 2017. Top examples of those early cars went from selling for about $24,000 to more than $35,000 today. A pristine 914-6, for years a $75,000 purchase, is now a $120,000 buy. These Porsches offer a driving experience unlike almost any other sports car, including the brand’s own 911. It starts before you even slide inside, as the doors open incredibly wide. The seats are placed practically on the pavement, and they offer adjustment for both rake and aft. It’s a welcoming, comfortable cockpit, with enough room for someone more than 6 feet tall. The dash follows Porsche’s usual setup: large, functional VDO gauges that are well placed. The steering wheel–usually featuring a black plastic rim, but wrapped in leather in the Appearance Group cars–lacks the vintage charm of some contemporaries, but it’s the right size and in the right place. 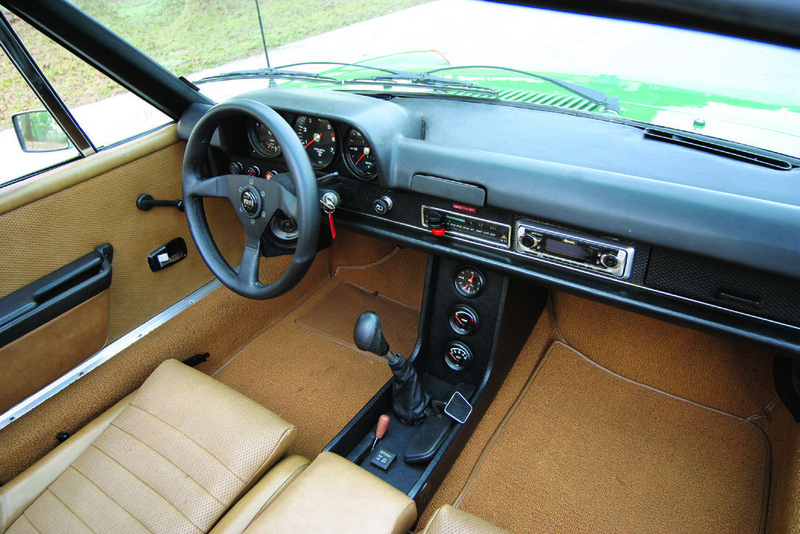 The 914’s driving position is low and stretched out, yet surprisingly comfortable. The two powerplants each come to life with a unique personality. 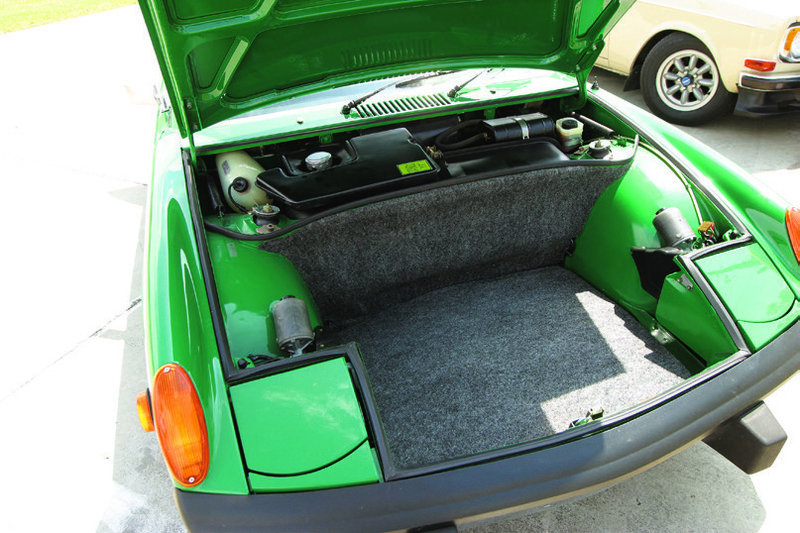 The fuel-injected 914 starts instantly and quickly falls into the typical tick of a loosely built, air-cooled engine. The 914-6, thanks to its downdraft carburetors, spits and starts uneasily, finally smoothing out once warm. The clutch is cable actuated, with no fluid assist of any kind, and feels light and direct. Pedal placement is spot-on. 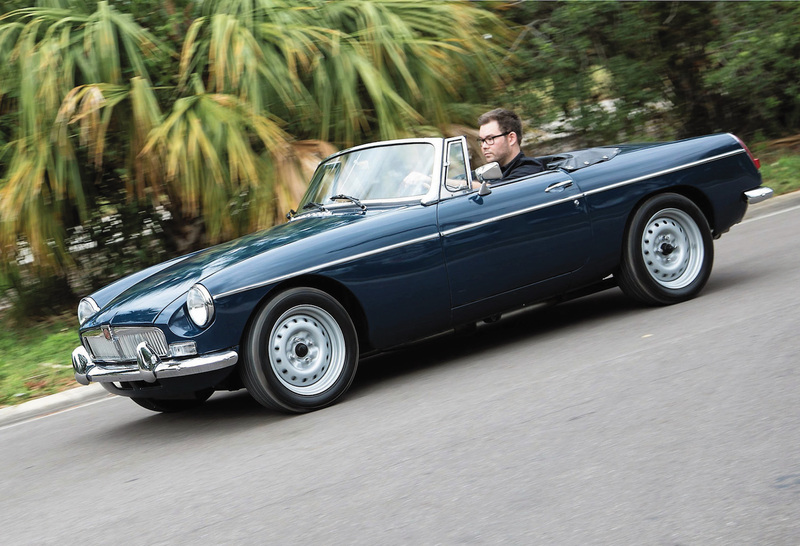 Once underway, both cars are lithe and easy to drive–just as they were when new. Thanks to their rearward weight bias, the steering feels nimble. The air-cooled Type 4 engine is not a rev-happy powerplant, and the relatively primitive Bosch D-Jetronic injection can be tricky to appease longterm. 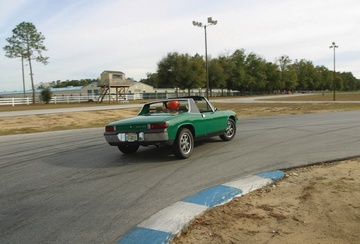 The 914-6 solves both issues, though, so it’s quick to rev and a little easier to maintain. 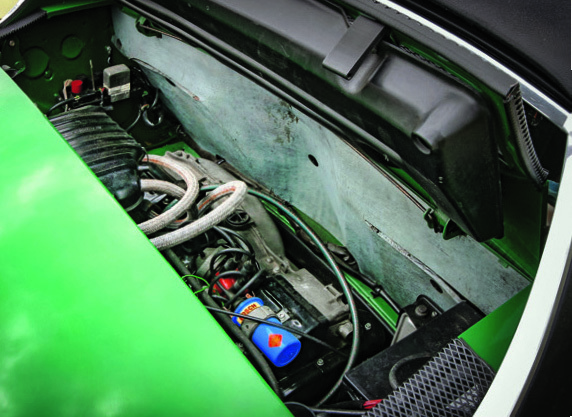 The 914’s dogleg gearbox–with first gear down and to the left–feels awkward at first, but George Hussey notes that most owners quickly get used to it. Reverse can be a bit too easy to engage coming from third gear. The 914-6 shifts a little more easily than the 914 but is still not perfect–depending on your point of view, call it charming, quirky or defective. No matter which powerplant is in use, the cockpit remains cool and quiet–just some tick-ticking from the engine filtering in from behind. The chassis is willing and able to change direction, and the brakes deliver stellar performance. Compared to nearly everything else from the class of 1970, the 914 and 914-6 feel more modern by almost any yardstick. Parting thought: Both the 914 and 914-6 deliver the classic air-cooled experience in a fetching Porsche-badged package. The Porsche 914 has always been a controversial car. You either love the styling or just can’t figure it out. It’s either the perfect convertible or a compromise. The interior is either too stark compared to the cars from Italy and Britain, or it’s the height of Teutonic practicality. And there are the drivelines. The Type 4 engine doesn’t sing like an Alfa twin-cam, but its parts are readily available. The 914-6 packs the right performance, but it carries a price premium. Then there’s the gearbox: Does it add character or annoyance? We’ve spent lots of time with 914s through the years and have come to value the positives over the negatives. For the money, we place the 914 ahead of the 914-6. Sure, extra power is nice, but it comes with additional weight–which, as George notes, is more likely to come around on you. The fuel injection, while primitive by today’s standards, behaves better than carbs. By most measures, the 914 is nearly as much car for a third of the price. Plus, it’s on par with the offerings of its day. If it’s any consolation, soon it will cost more than its contemporaries, too, and with good reason. George has some VERY nice 914s. A 2.0 914-4 would have been a better comparison. While the 914’s mechanicals are durable and most of the replacement parts are still available from Automobile Atlanta, rust remains the car’s biggest enemy. The hardest-hit area is typically on the right frame rail, behind the passenger seat and right below the battery tray. If the tray rusts out–and they nearly all have–then battery acid is allowed to pool on the frame. Over time, this can cause an otherwise good car to break in half. Check out the heat exchangers, too: Damage here can cause lethal exhaust leaks. Some owners remove these devices and replace them with exhaust headers, a move that doesn’t seem to dramatically increase horsepower, but does render the heating system inoperable. Many owners replace the fuel injection with a carburetor setup, figuring it’s a way to gain performance and reduce complexity. Today, it’s an easy way to ding a car’s value. Another very popular move is to swap out the Type 4 engine for something more potent, like a flat-six or even a Chevy V8. 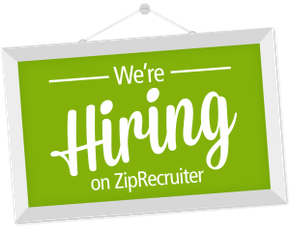 As always, whether this is a perk or a problem depends on your priorities: Do you want to be faithful to the original driving experience or are you looking for a hyper-tuned hotrod? 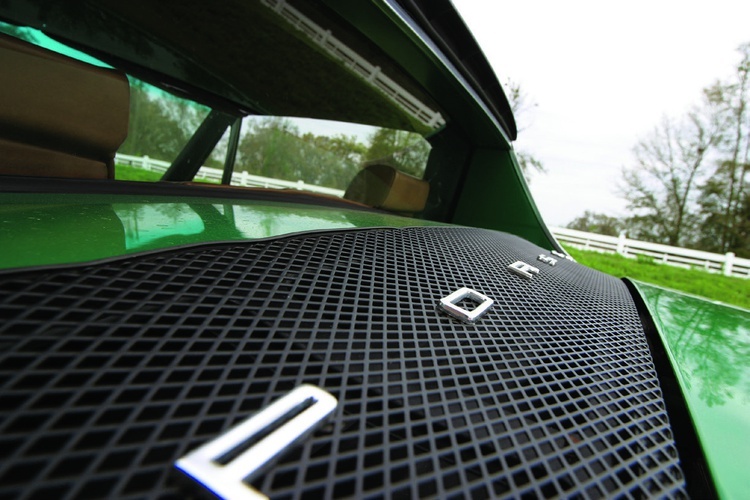 Back when 914s were throwaway cars, we built quite possibly the perfect one. Along with the larger bumpers, the later cars offer 2.0-liter power. Years ago, back when rust-free Porsche 914s sold for peanuts, we may have built the ultimate one. Our 1973 example sported slightly larger bumpers than the car we tested here, but 914s from that model year could be ordered with a 2.0-liter, four-cylinder Type 4 engine. The shifter mechanism had been improved by then, too. That car was a great high-speed tourer. It could tackle a 1200-mile road trip with no issues, despite running at highway pace for hours at a time. We parted with it, however, figuring 914 prices would remain low. If only our crystal ball had better resolution.